When you’re planning a wedding, it can start to feel like the littlest details are taking over your life: how many guests are coming? How many hotel reservations do you need? What if Aunt Mary and Uncle Joe are at the same table and cause a scene? Well, forget about the stress for a minute with Ceremonies’ five ideas that’ll guarantee you and your guests to have a ton of fun at your wedding. After all, it’s supposed to be a great party! If your friends and family are dance partiers, you must make your music selection carefully! If you’re going with a live band, make sure they’ll be able to play the songs that you and your friends will want to hear. Don’t forget to ask your DJ or band if they’ll take requests – if your friends and family can request their favorite songs, they’ll most definitely enjoy themselves all the more! To do your guests a huge favor, offer transportation from the ceremony venue to the reception, and from the reception back to the hotel. This way, no one will be worried about cars or parking or driving home later in the night – everyone can just focus on having a good time and a couple of drinks with family and friends. 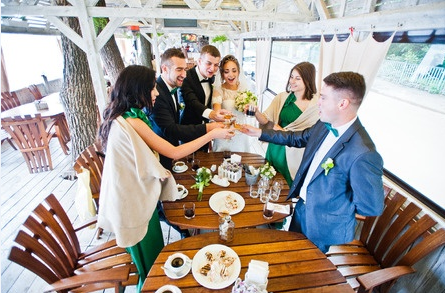 Whether you and your partner come from an Italian background (cue the pork roast rolling out on a table after everyone’s already finished with dessert), an Irish background (tons of local beers on tap and maybe bagpipers) or something totally unique, make sure your personalities shine through in the ceremony and the reception. Everyone will go to a couple cookie-cutter weddings this year – make sure yours isn’t one of them. Keep the toasts short and sweet! No one wants to sit still for 20 minutes listening to someone sing your praises. Save that for the card, people! Warn your guests that if they want to make toasts, they’ve got to be snappy. What better way to wind down the night than with a fireworks display, or the lighting of lanterns that will float away peacefully? Have your guests make their way outside at the end of the night for a final drink and a picture-perfect photo-op. Most importantly, remember that it’s a party! Your wedding is meant to be fun – for your guests and for you. Don’t sweat the small stuff, like the color of the napkins, or things you can’t control, like the weather. If you are in the spirit of celebration and happiness, your guests will be, too, and that’ll make for one unforgettably fun wedding. If you’re looking for some ideas about how to jazz up your ceremony, contact me today!